Projektionerna är ljudsatta av Andil Dahl och en mobil livesession rör sig i anslutning till de platser där verken visas. The French multi-artist Julien Nonnon transforms the Swedish capital with the exuberant exhibition SAFARI URBAIN STHLM. 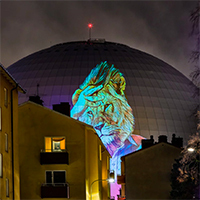 A series of portraits of animals, projected on the facades and buildings of classic and modern Stockholm landmarks. Stockholm’s residents, tourists and the world will see the city, the buildings and the night in a whole new light. The projections are set to sound by Andil Dahl and a mobile live session moves adjacent to the places where the works are exhibited.